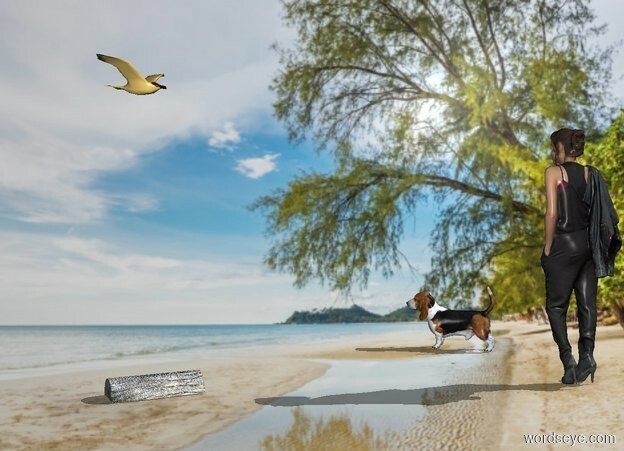 Input text: a scene backdrop.a woman.shadow plane.a dog is 3 feet in front of the woman.a bird is above the woman.it is 8 feet right of the woman.the bird is facing northwest.a log is 7 feet right of the woman.it is 2 feet in front of the woman.the dog is facing southeast. Wouldn't that be nice. :-) Nice shadows!